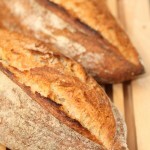 The dough from our French croissant recipe can be used for a lot of other delicious bakes. 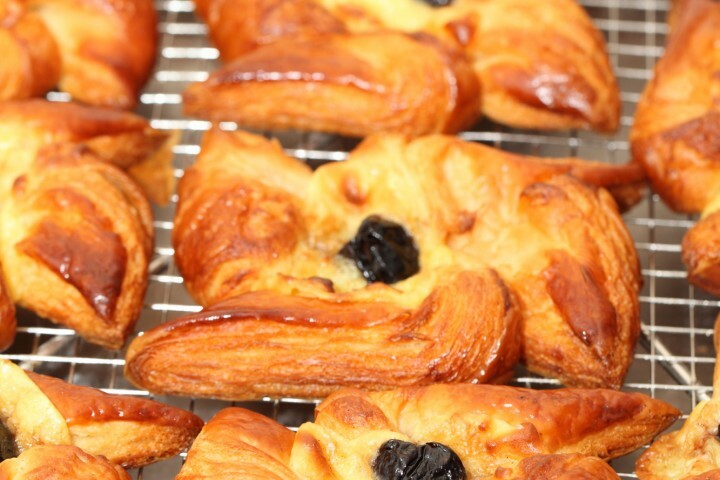 From pain au chocolat to all kinds of wonderful Danish. The success of all these bakes is based on the quality of the laminated dough of course. It needs to be light and flaky, with perfect layers of butter and dough. 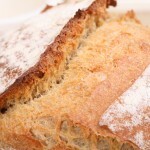 You need to have some solid baking knowledge (mixing, proofing, baking) under your belt to get good results. 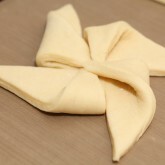 But if you already master a decent croissant, you will not have any problem making these special shapes. Above all, it is a lot of fun and you do not need to stick to these shapes or ingredients of course. 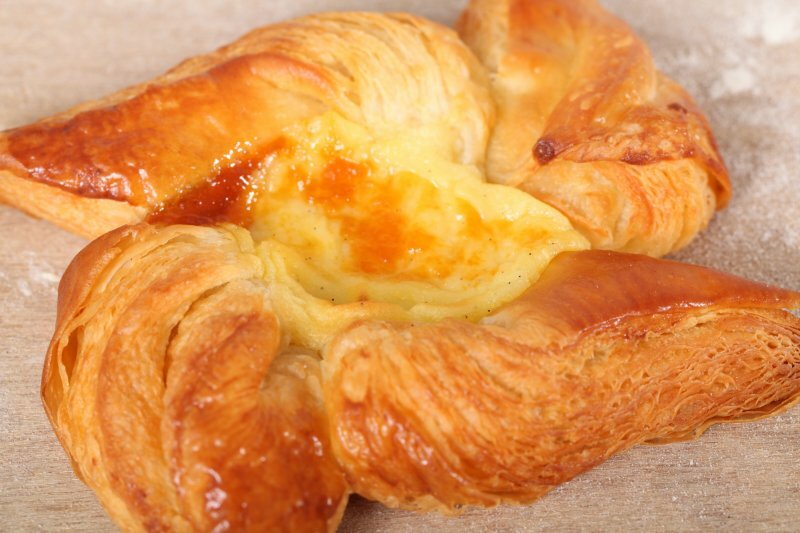 There are many more to try, like the pocket Danish or the ‘lunette’, or maybe something of your own invention. Most important: Be gentle while working with this dough. 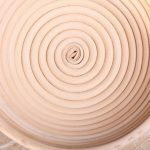 You worked hard to carefully build up the layers so you do not want to deflate or damage the pastry! Quantities! How many of what? The slab of pastry ideally is 100 x 20 cm (40 x 8 inch) after straightening the edges. 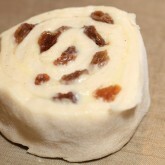 With a single slab you are able to make 10 pinwheels and 8 pain aux raisins. Cut the slab in half so you will end up with two pieces of 50 x 20 cm (24 x 8 inch). Using one of the 50 x 20 cm piece, cut out 10 pieces of dough measuring 10 x 10 cm (4 x 4 inch). 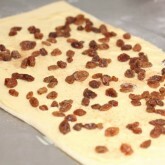 You can use the other piece to roll up and cut into 8 pain aux raisins (see instructions below). 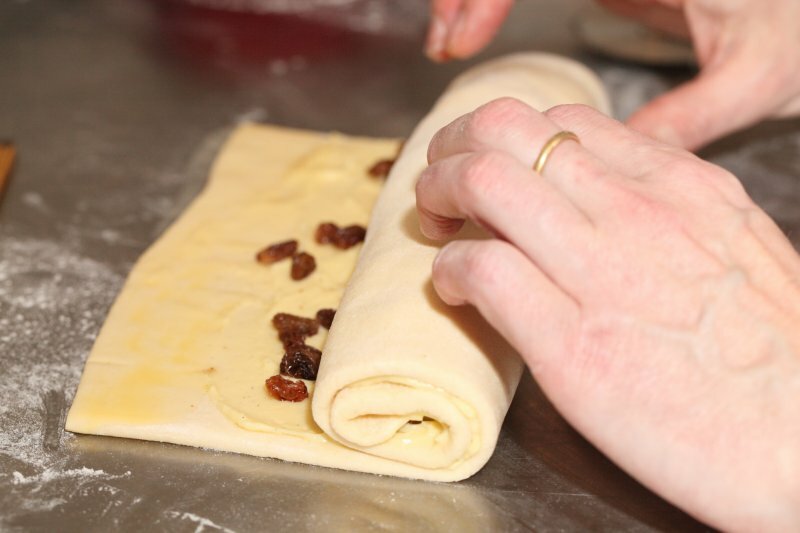 If you only want to make pain aux raisins you can divide your 100 x 20 cm (40 x 8 inch) slab into 2 pieces of 50 x 20 cm (20 x 8 inch). 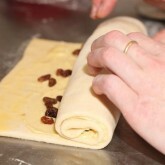 Each rolled up piece of 50 x 20 cm will be divided in 8 so you will end up with 16 pains aux raisins. If you choose to make it all about the pinwheels you can divide the 100 x 20 (40 x 8 inch) slab in 20 pieces of 10 x 10 cm (4 x 4 inch), thus ending up with 20 wheels. 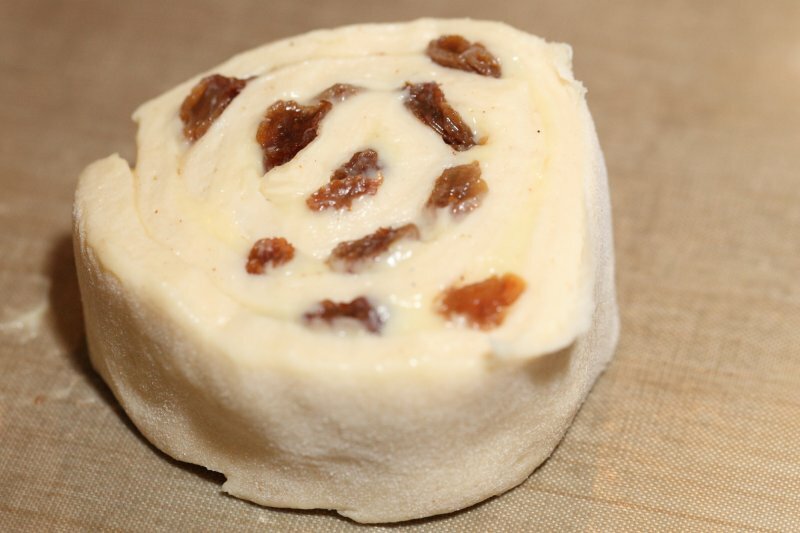 If you want to make sweet pâtisserie viennoise like the pinwheels and pain aux raisins you need to make a batch of laminated dough, the same as you would make for croissants. 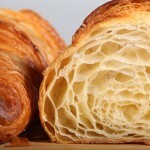 For those of you who have made our croissants, you know how this works and that it is not the easiest skill to master. You need practice to get it right. Of course there is no shame in buying good quality puff pastry and using that for a quick trial run. But in the end it is very rewarding and taste wise there is no comparison to make these pastries with your own fresh butter laminated dough. 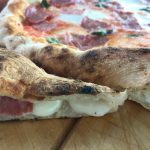 You can find our recipe for the laminated dough here. Follow the steps given in the recipe and on day three, instead of making croissants, you make pinwheels and/or pain aux raisins, following the instructions below. For the filling you need to make crème pâtissière / pastry cream. 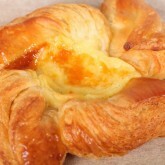 Our favorite recipe for the crème pâtissière can be found here. Depending on how generous you are you may not need all of it, so you can make the recipe and use what is left for other pastry projects or store it in the freezer. 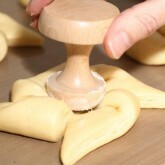 To make pinwheels you need squares of dough (10 x 10 cm / 4 x 4 inch). With a dough cutter / pizza wheel you cut each corner of a square toward the center (so you make 4 cuts in 4 corners) taking care to stop just before the center (see picture). Now you have a square with 8 ‘tips’ of dough. 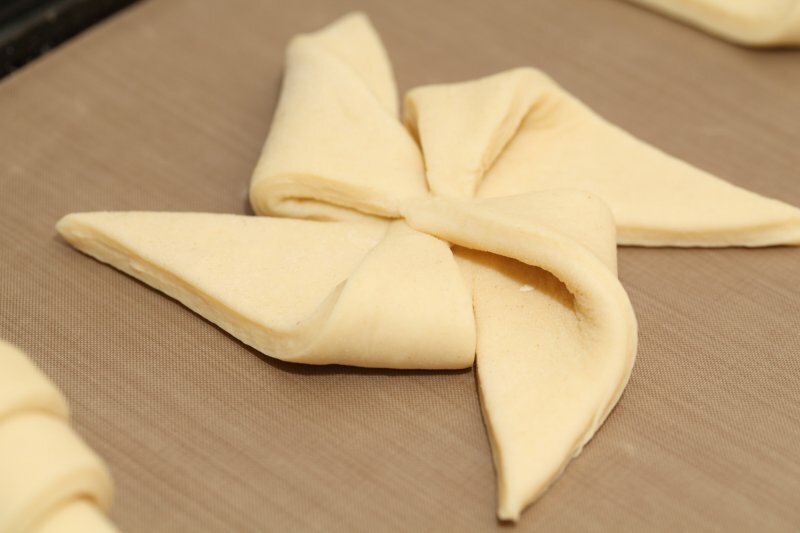 Take one tip of the dough square and fold it in to the center. Skip one tip, take the next and again fold it in to the center. The same with the other tips, skip, fold, skip fold. Press down softly in the center to secure the tips. Arrange the shaped pinwheels on baking sheets, making sure to keep enough space between them so they will not touch when proofing and baking. Combine the egg with a teaspoon of water and whisk until smooth. Give the pastries their first thin coating of egg wash. Proof the pinwheels draft-free at an ideal temperature of 24 ºC to 26.5 ºC (above that temperature there is a big chance butter will leak out!). 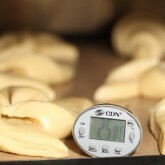 We use our small Rofco B20 stone oven as a proofing cabinet by preheating it for a minute to 25 ºC / 77 ºF. It retains this temperature for a long time because of the oven stones and isolation. The proofing at this temperature should take about 2 hours. 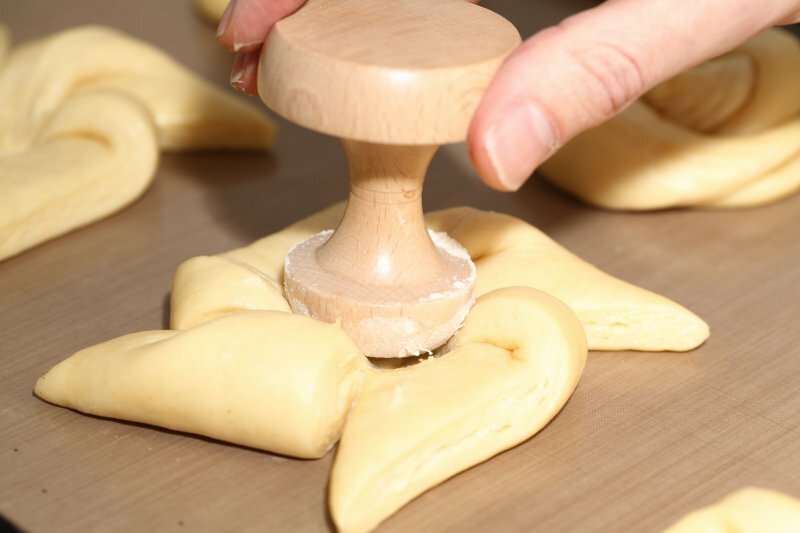 Once proofed, press the center to make a small dent, to prepare it for the filling and egg wash your pinwheels a second time. As you can see in the picture we use a tart tamper for this. Fill the center with a generous dollop of crème pâtissière and top it up with a almond liqueur soaked cherry, like we did, or some apricot jam or pieces of fruit of your choice. We also made versions with an apple, raisin cinnamon filling, which is very delicious too. For these you need a slab of laminated dough of 50 x 20 cm / 20 x 8 inch (also check the text about quantities above). Spread the dough with a thin layer of pastry cream, leaving an edge of 20 x 2 cm / 8 x 1 inch on the far side which you brush with water. 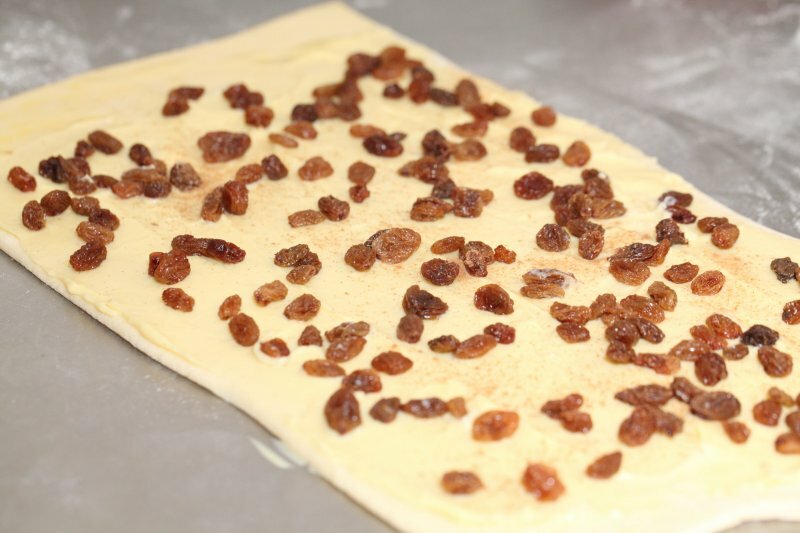 Sprinkle the raisins evenly over the pastry cream and optionally sprinkle with some cinnamon. 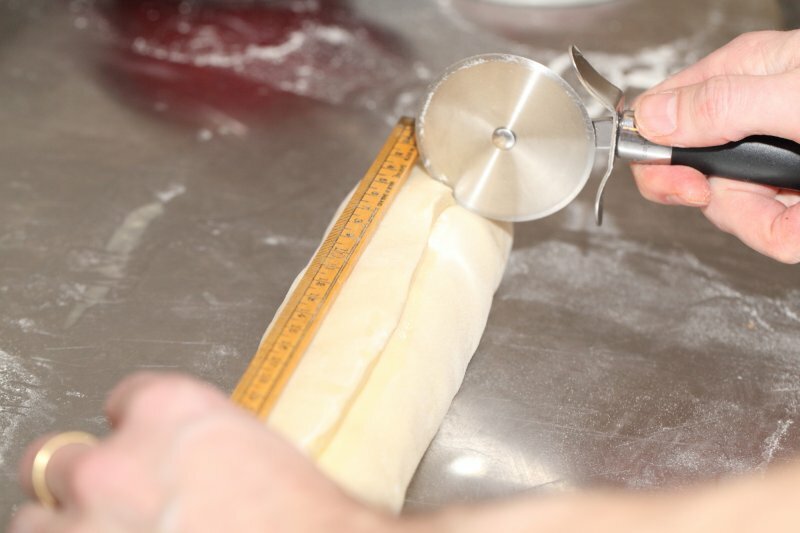 Roll up the dough toward the far side, not too tightly, so you end up with a roll of 20 cm / 8 inch. 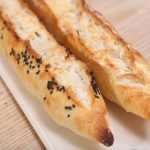 With a sharp knife cut into 8 pieces of 2.5 cm / 1 inch each, making sure not to press too hard on the dough because you do not want to damage the layers! Arrange the shaped pains on a baking sheet, making sure to keep enough space between them so they will not touch when proofing and baking. Combine the egg with a teaspoon of water and whisk until smooth. Give the pastries their first thin coating of egg wash. Proof the pain aux raisins draft-free at an ideal temperature of 24 ºC to 26.5 ºC (above that temperature there is a big chance butter will leak out!). 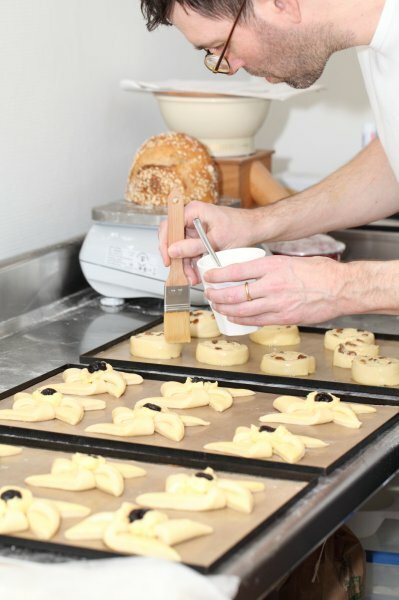 We use our small Rofco B20 stone oven as a proofing cabinet by preheating it for a minute to 25 ºC / 77 ºF. It retains this temperature for a long time because of the oven stones and isolation. The proofing at this temperature should take about 2 hours. 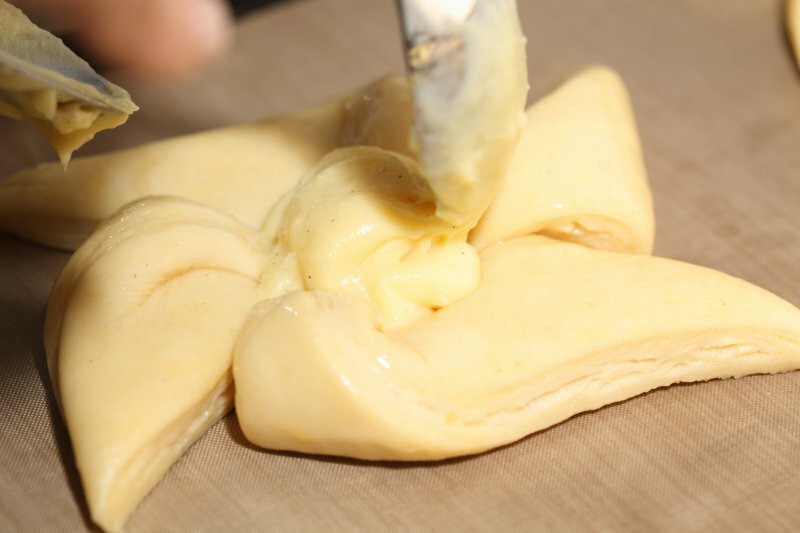 Once proofed, egg wash your pastry a second time. 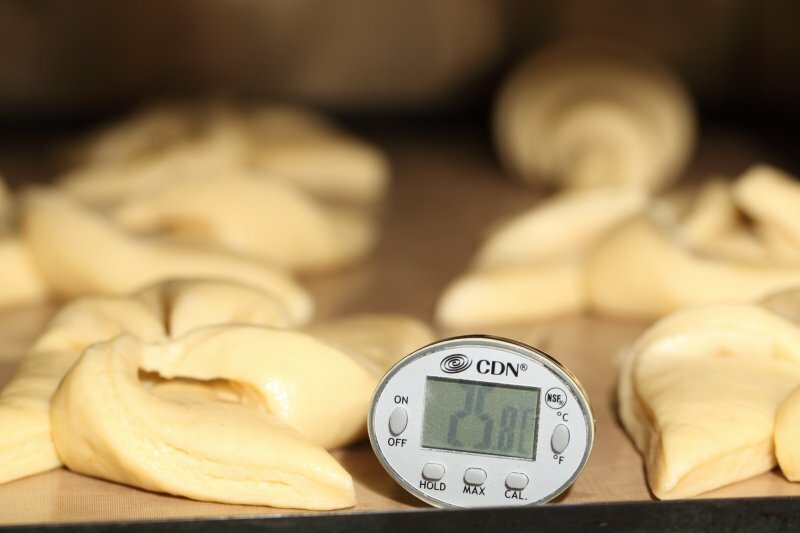 We bake the pastry in our big convection oven for 6 minutes at 195 ºC / 385 ºF , then lowering the temperature to 165 ºC / 330 ºF, and bake them for another 9 minutes. But you really have to learn from experience and by baking several batches what the ideal time and temperature is for your own oven. Keep a close look at your pastry during baking to see what’s happening and to act by lowering your temperature if necessary. Take the pastry out of the oven, leave for a few minutes on the baking sheet, then transfer to a cooling rack. Best eaten while warm and fresh of course. The ones we don’t eat or share we freeze the same day. When we want one for breakfast or brunch we take them straight from the freezer and put them in the preheated oven (180 ºC / 355 ºF) for 8 minutes. Nothing wrong with that, eaten nice and warm, almost as good as the fresh ones…almost! Why do we brush the far edge with water? This is cone to make the dough stick / glue together when you roll it up. Such happiness makes us humble. Thank you so much! Making the croissants were my first attempt at baking. They were fabulous ! Can’t Waite to try your suggestion .